It is indeed a bizarre case which has sent shock waves among not just Lucknowites but the whole country. In fact, there are two separate sequels in this incident. First is the constable shooting down a multinational executive for no apparent reason and second is the tremendous upsurge by men in uniform against the arrest of two cops. 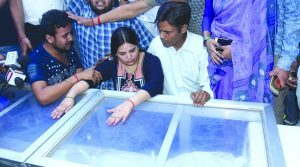 On September 28, the city woke up to the shocking news of the random shooting down of 38-year-old Vivek Tiwari, Apple executive, in the wee hours in the state’s capital Lucknow. Driving his SUV, Tiwari was returning home from a late night official party with a female colleague when he was allegedly asked to stop, failing which he was shot down by police constable Prashant Chaudhury who was on patrol duty with constable Sandeep Kumar. The news created an uproar in the city known for its ‘pehle aap’(first you) culture. Prashant and Sandeep were arrested and sent to jail. The accused cop just before his arrest gave interviews to the media, while his wife Rakhi Malik, also a UP constable, stood beside him and gave anti-police statements stating that justice was not done to her husband by the seniors and he was not allowed to file an FIR. Next followed an immediate upsurge of near revolt in the constabulary after the arrest of the two constables. The protest by policemen was partly vocal and mainly through social media. The men in khaki donned black bands as mark of protest and gave statements against the senior officers before the press and flaunted pictures of protest on the WhatsApp and Facebook and all this without fear of punishment and in total violation of the Police Service Regulation Act. The appeal of the Chief Minister and Police chief seemed to have no effect on their behavior. A red-faced police chief OP Singh had a hard time explaining to the media about not just the total lawlessness in Lucknow wherein a man driving down just a few km from the police headquarters with a female colleague was shot dead by a constable, but also had no answer why there was this outbursts by his men in uniform. 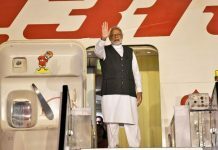 Singh asserted that severe action has being taken. 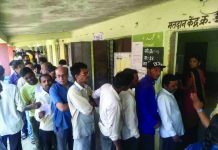 While three cops from three different police stations in the city-Naka, Gudamba and Aliganj were suspended, three station house in-charges were removed and several sent to line. These policemen were not only leading ‘black Day protests against the arrest of the cops, whom they said were put behind bars without any inquiry, but were also uploading pictures on social media of the protest. Constable Prashant had alleged that he had to fire in “self-defence” as Tiwari refused to slow down when signaled and was trying to escape. Prima facie Prashant’s statements have so far not shown any signs of truth. The open protest and solidarity by a big segment of the state police force have shown that the policemen had no respect for the Service laws by which they were bound. They openly charged the senior officials of playing to the gallery and not protecting their own men. The anger and resentment against the cops’ arrest was visible right from the time of the arrest. The UP police association supported the accused and unitarily declared October 5 as ‘Black Day’ to register their protest. This revealed the chinks in the armor of the UP police and the opposition allegation that all is not well with the management of the state police. While the DGP has ordered probe into the entire incident, the widow of the victim, Kalpana Tiwari, who has been offered 40 lakhs, a government accommodation and a job as PRO in Nagar Nigam by the chief minister as compensation has demanded adequate punishment for the policeman who killed her husband for no reason and suspension of those policemen who are supporting the killers of her husband. There has been a strong and united protest by the Opposition who allege that there is no law and order left in the city and that the life of the common man is in grave danger when cops shoot down innocent men in the state capital. “Totally appalling and disgusting. 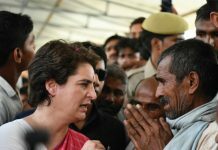 There is a complete breakdown of the state machinery in the state,” is how Syed Zeeshan Haider, Congress spokesperson in the state reacted to the incident. 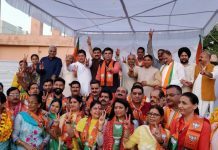 Lambasting the BJP government for total failure on all front, Haider expressed full sympathy with Tiwari’s family which includes his small daughters. Ridiculing the contention of the constable that Tiwari was trying to escape and run over his motor bike, Haider said that the most easy and sane option should have been in the case Tiwari was trying to escape would have been to aim at his car tyres and not his head. He said that what happened is not a very healthy sign in a democracy. He said that it is evident that the morale of the police force morale is so low that they had to come down to this state and breached all barriers of discipline and official guidelines. While appealing for a fair and fast trial in the case Haider suggested that the government must look into the reasons behind the police revolt as this is a grave issue and involves the security of its citizen. The police officers obviously caught off guard initially tried to defend itself by saying that the pictures of uniformed protestors were morphed. But soon under media pressure the police had to retract and DIG (law & Order) Praveen Kumar Tripathi said that no in disciple will be tolerated and the guilty policemen will be dealt as per the laws and rules of the Police department. The Police non Gazatted employees welfare association state general secy Avinash Pathak posted in 37 PAC, Kanpur who had supported the errant cops was arrested. Some policemen are demanding that the police regulation Act must be changed and that the senior officers must look into the grievances of the junior who are always under pressure and pushed against the wall as they are always at the receiving end. After this incident, the state police is taking measures to set its own house in order. While warnings have been issued and a strict vigil is being enforced on postings on social media by the cops, special refresher courses for better policing and based on behavior change have been initiated in the state capital which will be later done in other state cities too.